For countersinking and deburring in a wide range of ferrous and non-ferrous materials. Radially relieved single cutting edge for fast stock removal without chatter in portable and machine applications. Tools can be re-sharpened using an axial relief sharpening fixture or with a mounted grinding wheel inserted into the hole. 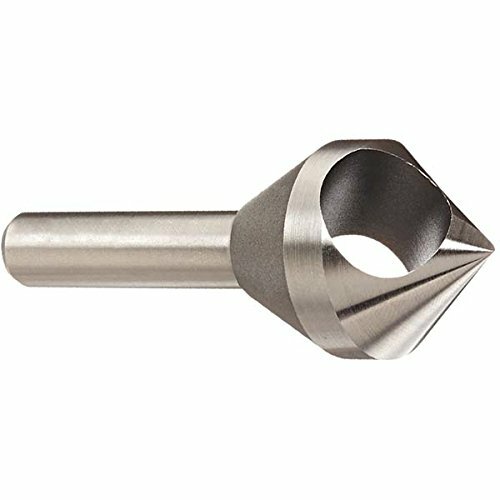 KEO ZErO flute countersink and deburring tools are simple, all-purpose tools made of Cobalt that provide flawless countersinking and deburring. The chatter-free cutting action requires minimal power. The microsmooth CNC precision ground construction produces clean, smooth cutting without smearing on a variety of materials. The tool especially excels in countersinking or deburring holes in aluminum, plastics and other nonmetallics. Cobalt steel tools are similar to high-speed steel, but with more cobalt for improved performance when cutting harder metals such as stainless steel or nickel alloys. Uncoated tools feature just the base substrate without any additional treatment or coatings and are suitable for a wide range of applications. Round shanks allow use with a wide variety of toolholding systems. When run in a counterclockwise direction (right-hand cut) spiral fluted tools evacuate chips up and out of the cut to reduce clogging. 90 degree angle. KEO 6-flute line of countersinks are companions to our single flute countersinks and our 3- and 4-flute center reamer line. As a rule, the more edges per revolution, the greater amount of material that may be removed. We have designed the 6-flute tools with staggered cutting edges. Solid carbide tools offer long tool life and faster cutting speeds than other substrates, but are more brittle and must be used with rigid toolholding systems. Uncoated tools feature just the base substrate without any additional treatment or coatings and are suitable for a wide range of applications. Round shanks allow use with a wide variety of toolholding systems. When run in a counterclockwise direction (right-hand cut) spiral fluted tools evacuate chips up and out of the cut to reduce clogging. 82 degree angle. 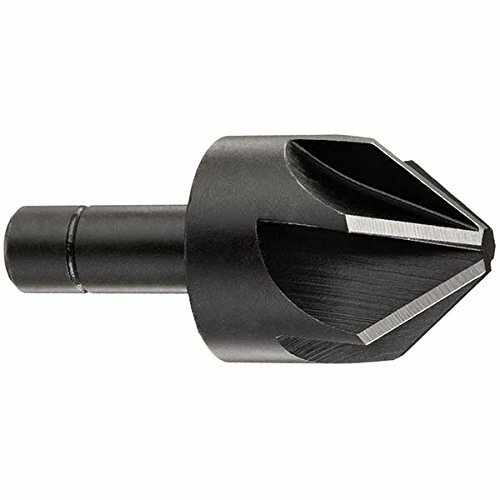 Drill America DEWCHAT Series 6 flute chatterless countersink is designed to provide more metal removal then the 1,2,3, and 4 flute countersinks. They are also more effective on harder materials. High-speed steel tools are good for most general purpose applications, offering a combination of hardness and toughness for wear resistance. Round shanks allow use with a wide variety of tool holding systems. Through-hole flute style has a single flute that passes through the cutting head to reduce vibration and chip clogging; also called "zero flute". Cutting edge geometry designed to reduce chatter and harmonics. Six flutes allow higher feed rates and provide longer tool life due to distributing the cutting load over a greater number of teeth. Straight shank, CNC precision cam ground, M35 cobalt, chatter-free cutting action. Made in Great Britain. Cobalt steel tools are similar to high-speed steel, but with more cobalt for improved performance when cutting harder metals such as stainless steel or nickel alloys. Uncoated tools feature just the base substrate without any additional treatment or coatings and are suitable for a wide range of applications. 82 degree angle. Each 5-piece set includes one piece each of 1/4, 3/8, 1/2, 3/4, 1" body diameter with a particular included point angle. ISO 9001:2008 certified. Cobalt steel tools are similar to high-speed steel, but with more cobalt for improved performance when cutting harder metals such as stainless steel or nickel alloys. Uncoated tools feature just the base substrate without any additional treatment or coatings and are suitable for a wide range of applications. 90 degree angle. The tool especially excels in countersinking or deburring holes in aluminum, plastics and other nonmetallics. 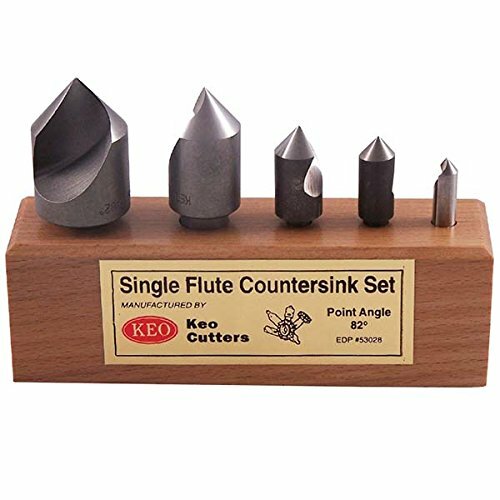 KEO 6-flute line of countersinks are companions to our single flute countersinks and our 3- and 4-flute center reamer line. As a rule, the more edges per revolution, the greater amount of material that may be removed. We have designed the 6-flute tools with staggered cutting edges. High-speed steel tools are good for most general purpose applications, offering a combination of hardness and toughness for wear resistance. Uncoated tools feature just the base substrate without any additional treatment or coatings and are suitable for a wide range of applications. Round shanks allow use with a wide variety of toolholding systems. When run in a counterclockwise direction (right-hand cut) spiral fluted tools evacuate chips up and out of the cut to reduce clogging. 82 degree angle. 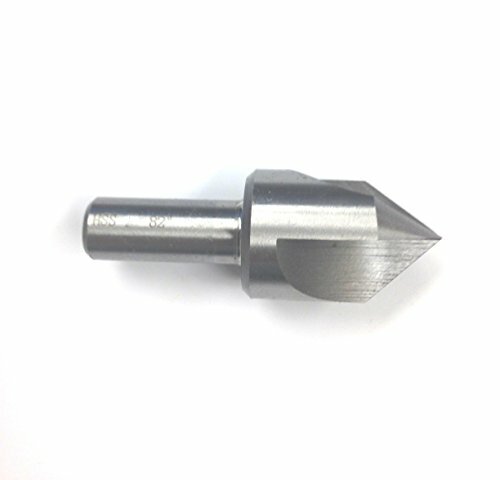 Drill America piloted 82 degrees countersink is high-speed steel tools are good for most general purpose applications, offering a combination of hardness and toughness for wear resistance. 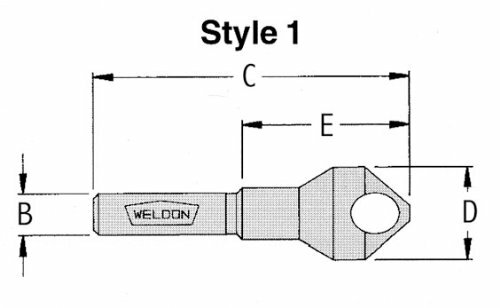 Weldon shanks feature a round shank with one of more flats machined into the side for easy indexing and alignment. Through-hole flute style has a single flute that passes through the cutting head to reduce vibration and chip clogging; also called "zero flute". 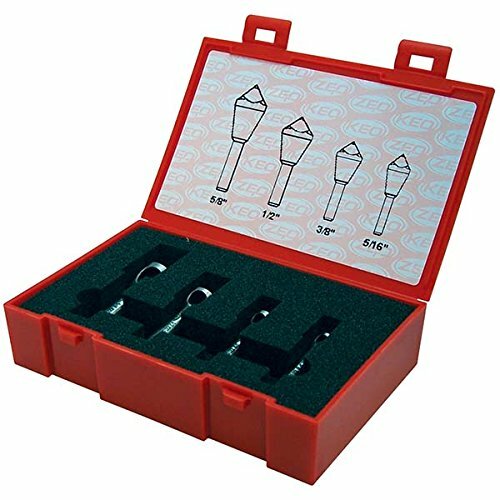 Each 5-piece set includes one piece each of 1/4, 3/8, 1/2, 3/4, 1" body diameter with a particular included point angle. ISO 9001:2008 certified. Cobalt steel tools are similar to high-speed steel, but with more cobalt for improved performance when cutting harder metals such as stainless steel or nickel alloys. Uncoated tools feature just the base substrate without any additional treatment or coatings and are suitable for a wide range of applications. 82 degree angle. Utilized in countersinking screw and rivet heads and for centering lathe work. 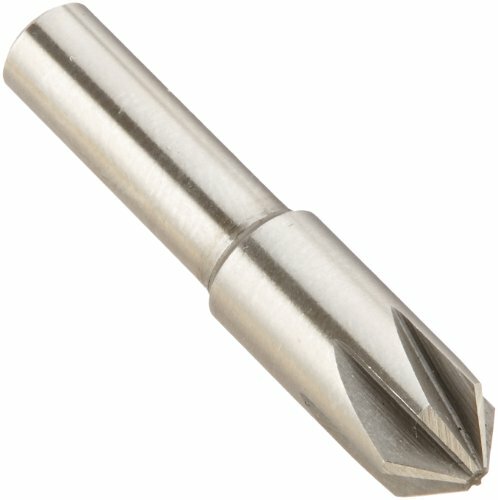 3-Flute eliminates chatter in most applications, while providing better accuracy than a single flute countersink. Utilized in countersinking screw and rivet heads and for centering lathe work. 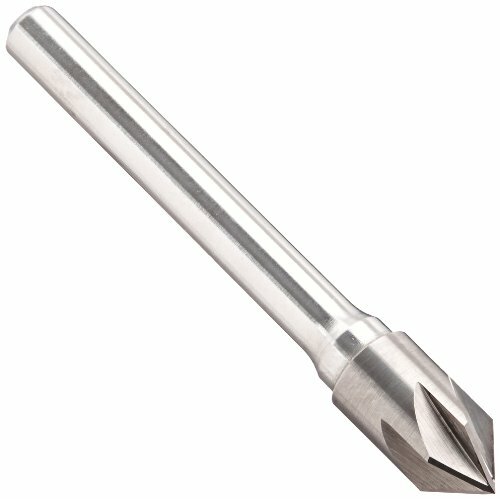 3-Flute eliminates chatter in most applications while providing better accuracy than a single flute countersink. Overall length is approximately 3-1/2. 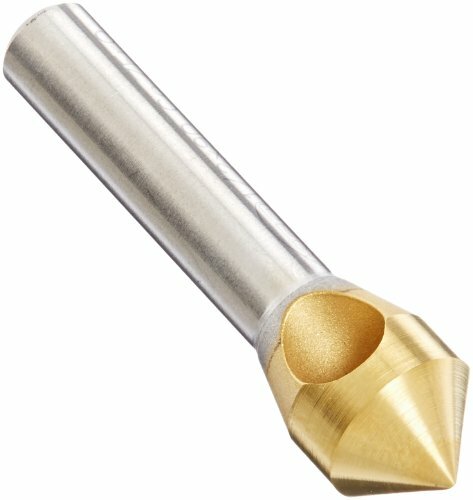 KEO ZErO flute countersink and deburring tools are simple, all-purpose tools made of Cobalt that provide flawless countersinking and deburring. The chatter-free cutting action requires minimal power. The microsmooth CNC precision ground construction produces clean, smooth cutting without smearing on a variety of materials. The tool especially excels in countersinking or deburring holes in aluminum, plastics and other nonmetallics. Cobalt steel tools are similar to high-speed steel, but with more cobalt for improved performance when cutting harder metals such as stainless steel or nickel alloys. Titanium nitride coatings add a hard layer of gold-colored ceramic to the surface that extends tool life and permits faster cutting speeds than uncoated tools. Round shanks allow use with a wide variety of toolholding systems. When run in a counterclockwise direction (right-hand cut) spiral fluted tools evacuate chips up and out of the cut to reduce clogging. 82 degree angle.